Syriza has decisively ruled out the “Grexit” option, according to EU Parliament Vice President and Syriza MEP Dimitris Papadimoulis, who spoke in an exclusive interview with EURACTIV Greece in Strasbourg. Since the announcement of the presidential vote in Greece, several reports in Europe have claimed that international markets would not trust a Syriza government, and that the main opposition party has the so-called “Back to Drachma Plan B”. Last week, the stock market in Athens suffered its worst day in decades, and Greek politicians bickered over the political uncertainty provoked by the presidential vote. Greece’s largest opposition party, Syriza is currently ahead in the polls. A snap election could find the party into power. In an interview with EURACTIV Greece, Papadimoulis, an influential figure in Syriza, attempted to dash these fears, saying that a Syriza government is committed to keeping the country in the eurozone. “There is absolutely no case for a Grexit. Those who invoke such a possibility play a propaganda game against the Greek and European economy,” Papadimoulis said. He added that the actual danger for Greece is its social disintegration and its transformation intoto a “debt colony” and for Europe, a new phase of recession, higher unemployment and poverty. 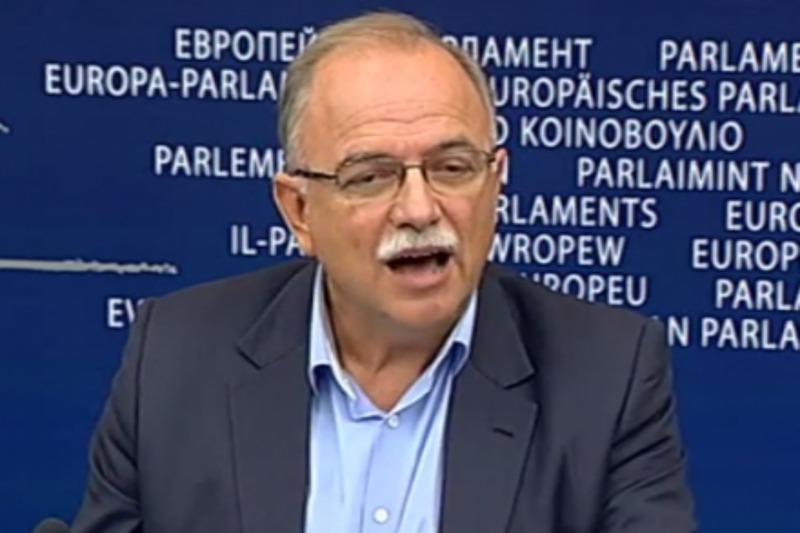 In an attempt to appease international lenders and possible investors’ fears, Papadimoulis made it clear that there is no Syriza party member who speaks in favour of returning to the drachma. “All our members respect the party’s decisions which are pretty clear… We will seek a solution for Greece within the eurozone,” he stated, blaming a significant part of the Greek press for badmouthing his party’s policies. “If you look at the titles of some TV news, or the front pages of some Sunday newspapers, they are so similar to each other, like having the same editor, possibly based in a basement of PM’s office,” Papadimoulis said. Papadimoulis’s main argument for the non-Grexit scenario was based on the fact that Greece is still a systemic danger for the eurozone. “That is the main reason why there is no possibility for Greece getting out of the Eurozone, as the cost of such an adventure would be huge for the Eurozone as a whole, Germany included”, he said. Prime Minister Antonis Samaras has brought forward a presidential election by two months to end political uncertainty but faces an early parliamentary election. Current Finance Minister Gikas Hardouvelis warned in recent comments that the country faces financial trouble after February if it fails to elect a president, prompting the opposition Syriza party to accuse the government of blackmail to win support. Greece would face funding problems if a snap election fails to produce a government that can wrap up a pending bailout review due to unlock €7 billion in aid, Hardouvelis said. Greece needs to repay IMF loans worth about €2.8 billion by the end of March. Its next major funding hurdle comes in July and August when it has to repay over €5 billion in maturing debt. 17 December: Vote for President begins in Parliament, last round to be held on 29 December. EURACTIV Greece: ?????????? ?. ??????????? ???? EURACTIV: ?????? Grexit ??? ?????? ?